Alex is a Physics and Astronomy major at the University of Hawai‘i at Hilo, hoping to impact the science community with the skills he is learning. Coming all the way from Rhode Island, Alex has been involved with the Institute for Astronomy for a couple of years, working in the machine shop on the UH 2.2-meter telescope under Colin Aspin. 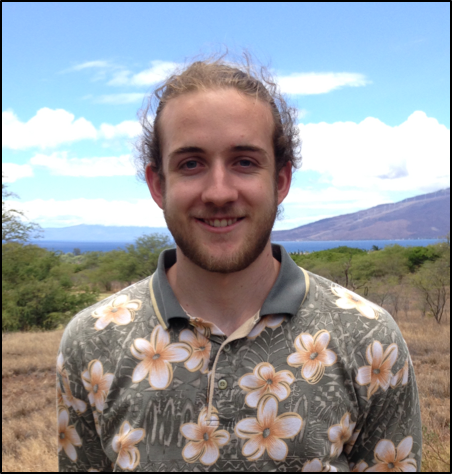 He has also been working as a 2015-2016 Hawai‘i/NASA Space Grant Trainee learning data reduction with Dr. Kathy Cooksey, an assistant professor of physics and astronomy at UH Hilo. Alex found that he has developed an interest in instrumentation and observational astronomy. He plans to attend graduate school in a related field soon after he graduates within the next year. The Maui Space Surveillance Site (MSSS) currently has no instrument solely dedicated to quantifying its observing conditions. The Differential Image Motion Monitor (DIMM) technique can be used to measure turbulence parameters such as the Fried parameter (r 0 ) and astronomical seeing (). By implementing a DIMM for the MSSS, the observing conditions will be characterized, giving information as to how the atmosphere affects a telescope’s image quality. The DIMM will also give insight as to how Haleakala compares to other astronomical sites. Our DIMM consists of a 12-in aperture Ritchey–Chrétian telescope and its necessary components (science camera, filter wheel, focuser). I wrote a MATLAB code to calculate turbulence parameters from images taken by the telescope. In preparation for the first observations, I generated simulated images with MATLAB to test r 0 and calculations and their uncertainties. The DIMM will be manually tested by August 10, 2016, and the first measurements will be made by then. Future work for this project will involve automating the DIMM so that it will continuously measure atmospheric parameters throughout the night and day.